NOW: In his attempt to reach Moran’s altitude on the north side of Lenora Street, Jean Sherrard had to leave his prospect and visit instead a rooftop on the south side of Lenora. That he was still some feet lower than Moran can be determined by the relative location of the distant Magnolia Peninsula in the two views. On a windy summer afternoon (can you see the bush shaking?) Robert Moran loaded his camera with a glass negative and exposed this look down – way down – from the summit of Denny Hill into the heart of Belltown. 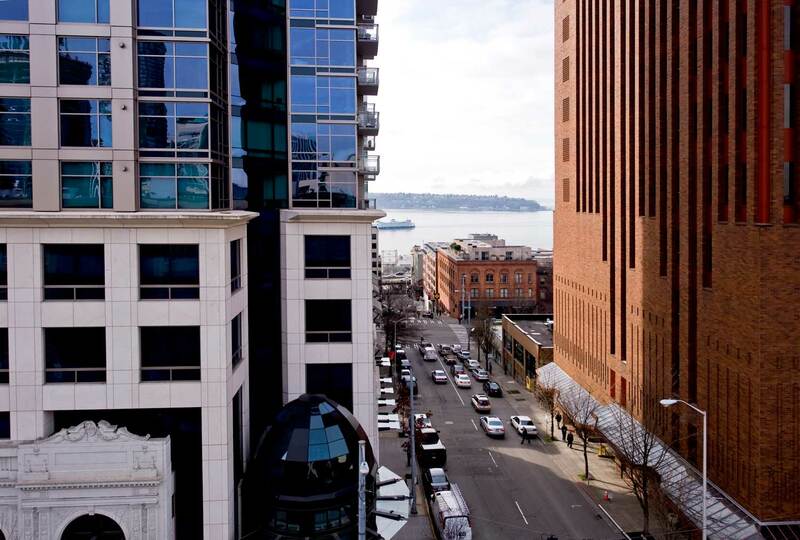 The 37-year old ship builder and former mayor was one of Seattle’s best expressions of the post civil war Horatio Alger ideal of a guileless young man who by dint of energy and ambition turns a dime into a fortune. Moran steadied himself against the wind in the back yard of his neighbor to the west, hardware dealer Percy Polson, whose home like Moran’s also looked south over Lenora Street between Second and Third Avenues. This is one of the rare intimate views of the old “North Seattle” neighborhood before it was razed for the commercial convenience of flatter land. 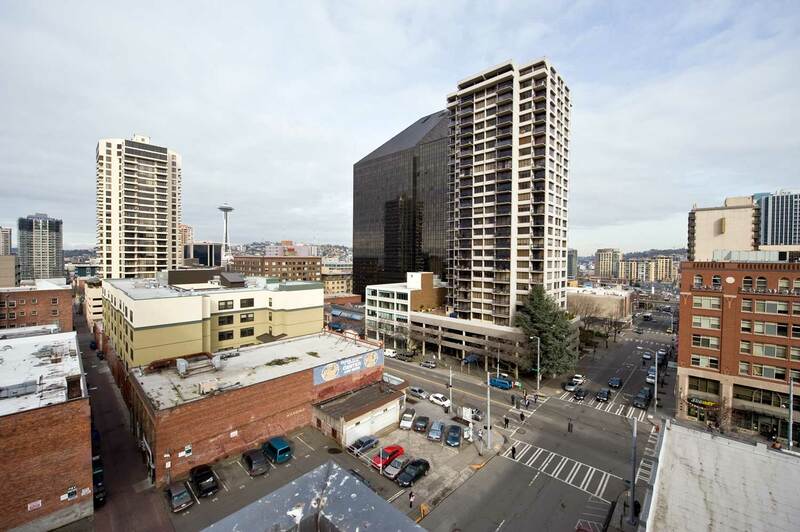 The Denny Regrade was completed just in time for the automotive age when it was no longer needed. Most of the many surviving photographs of the neighborhood are of that dramatic regrading which began on First Avenue in 1899 and, after a pause, resumed here along Second Avenue in 1903. A small portion of the pre-regrade Second Avenue directly north of Blanchard Street is evident bottom-left. 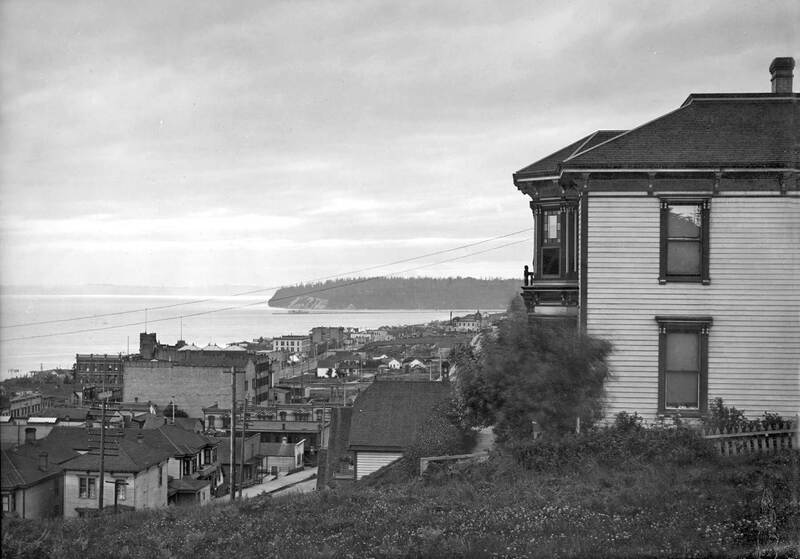 By 1906 the not-so-old house, shown here in 1895 with the distinguished bay window looking west to Elliot Bay, was either moved or destroyed – most likely the later – as a steep bluff along the east side of Second Avenue was formed with the lowering of Second Avenue to its existing grade. 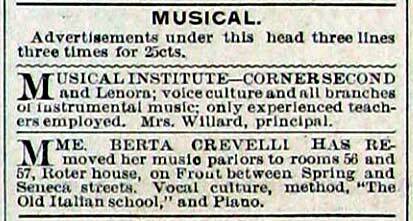 For the contemporary repeat of Moran’s recording Jean Sherrard and I underestimated Denny Hill. Returning to the prospect of Polson’s back yard was not possible without a hook and ladder. 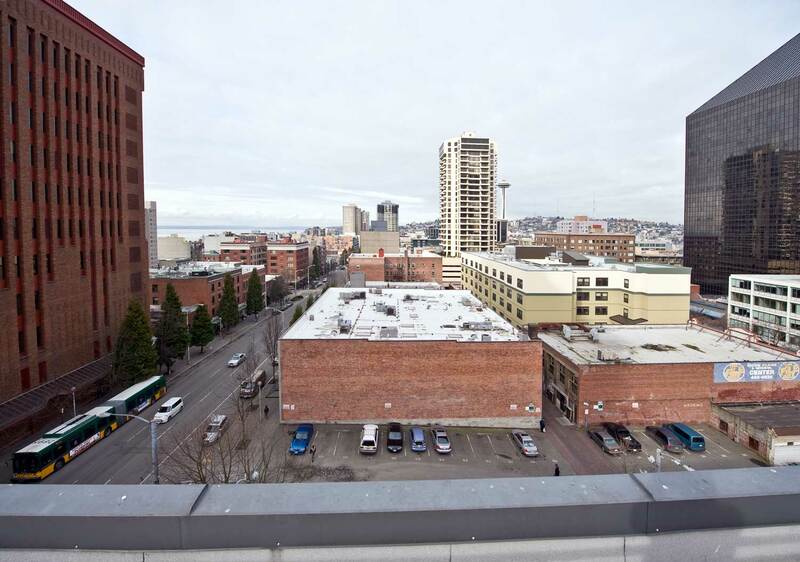 But across Lenora the roof of the new six-story apartment building awaited Jean. From there he could look directly across or thru Moran’s point-of-view – or nearly. That rooftop is also lower than the hill by about twenty feet. Sharing new evidence of the old Denny Hill neighborhood is always a treat. That his home at 216 Lenora Street was also the domestic retreat for the industrious Moran clan lets us imagine what magnitude of zest must have been regularly played out here. After seven years of working on steamboats, Robert Moran opened his own marine repair shop on Yesler’s wharf in 1882 and sent for his mother and four younger siblings to join him from New York. Five years later he was elected to the city council and in two years more mayor. 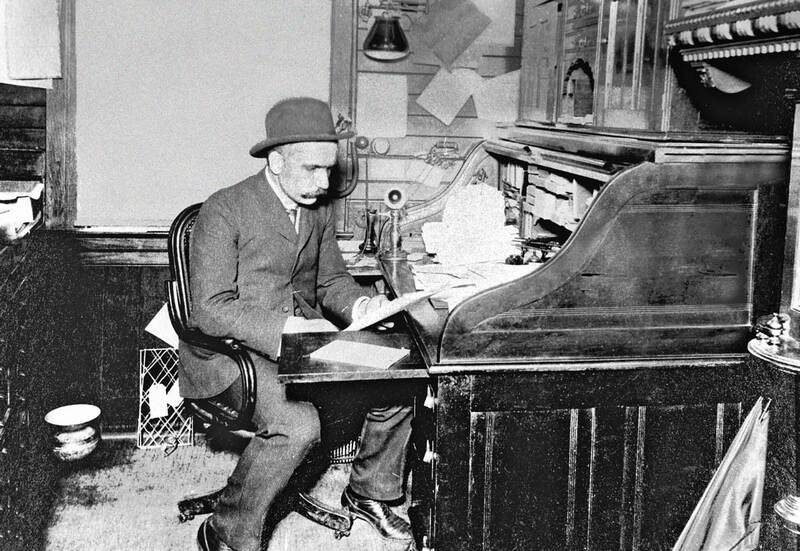 The city’s Great Fire of 1889 came on his watch and the talented machinist helped engineer the rebuilding of Seattle. In the year Robert Moran shot the above photograph of his Denny Hill home, he added steel-hulled shipbuilding to his ever-growing business. In nine years more he launched the Battleship Nebraska from his shipyard south of Pioneer Square. Also in 1904 he retired with his wife and five children to Rosaria, the lavish country estate he was then building on Orcas Island. In the 1960s another industrialist, John Fluke, discovered this view and many more glass negatives tucked in the Rosaria attic. Fluke Foreman Hal Will printed them up and it is Will — founder and long-time editor of the Puget Sound Maritime Historical Society publication SeaChest — who shares with us this new glimpse into the lost neighborhood of Denny Hill. Homes with ornaments, especially ones like this Victorian number, are described by architects as having “expressive vocabularies.” This duplex could talk to itself. The porches are like portraits with perfectly round eyes, large arching noses and steps for lips. The chitchat between them would be well stocked with puns, playful arguments by analogy, florid and yet controlled digressions and the occasional spontaneous rhyme. 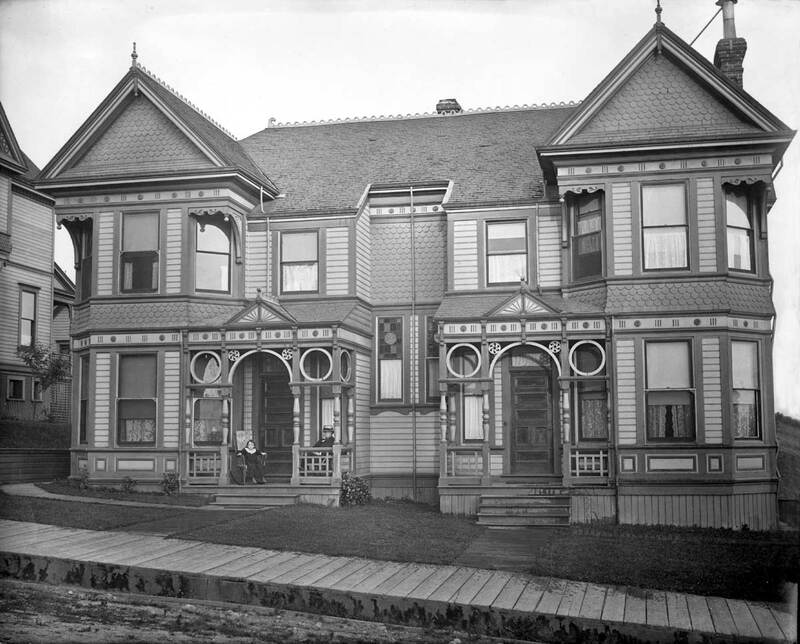 During the late 1880s and throughout the 1890s the hills of booming Seattle were quickly developed with many fanciful residences like these. Working variations on the Victorian home style then popular, Seattle builders were well stocked with relatively cheap lumber and an army of Scandinavian carpenters who knew how to use a scroll saw, read a pattern book with imagination, and paint these ladies with three, four, or five sympathetic hues. Between its skirt and the combed cresting and finial points on its roof this duplex is plenty expressive. With bands of fish scale shingles and patterned trim, paneled doors, spindle work and sunburst gables above those expressive front porches, this is the type of architecture that would soon repel modernity. Consequently, very few homes like this one survive. 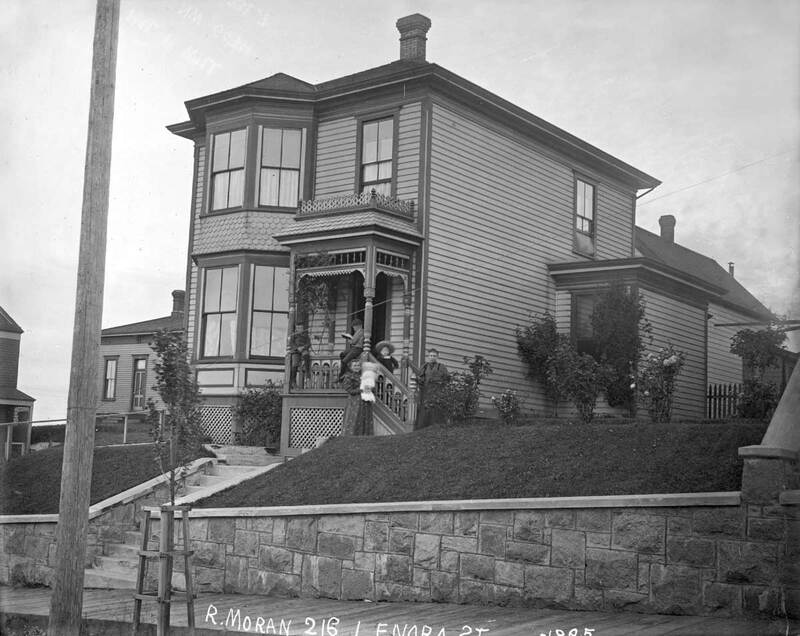 The likely date for this view of 217 Lenora Street is 1895, the year given a photograph of Mayor Robert Moran’s home across the street at 216 Lenora Street. That scene – like this one also from the Moran collection of large glass negatives — appeared here about three months ago. “The Willard’s home” is written on the negative holder. WOW!! !The view from the top of Denny Hill is incredible!! 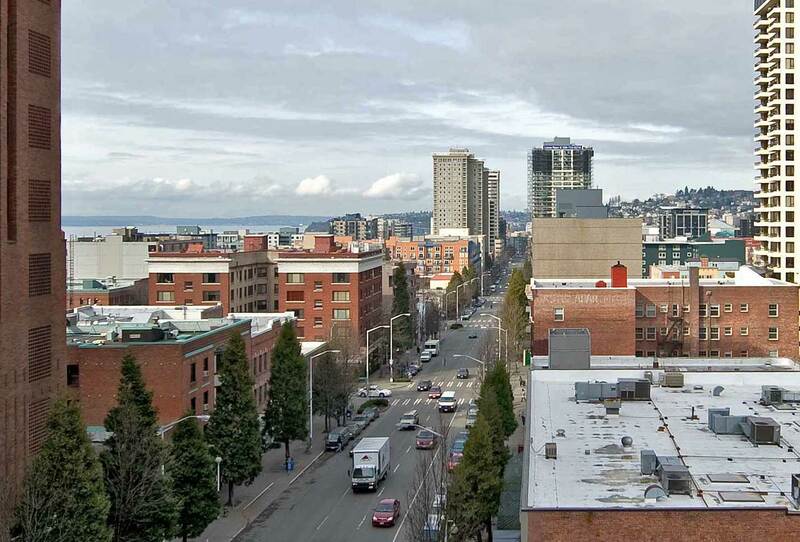 !I’ve always appreciated what Seattle destroyed during the regrades, but this view really shows what a beautiful neighborhood it was. In ’85-’86, I lived on Blanchard, in the old Cornelius Holtel (an apartment by then). I remember being impressed by just how large the “Darth Vader” building actually is, as it was just at the other end of the block. If the shot showing the west looking view were turned around, you might be able to see a grocery store (It was a “Larry’s” last time I was out there). You may remember that used to be The Astor Park.